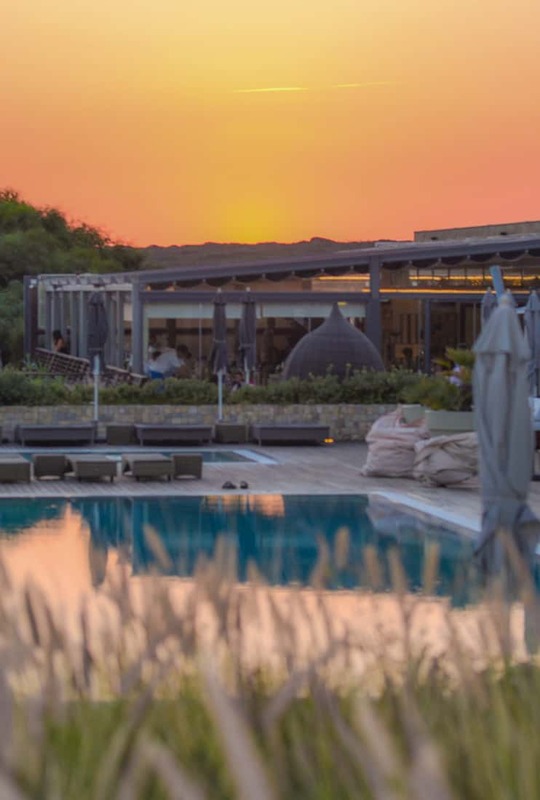 The owners of Martinhal Resorts created a vision for a family luxury hotel brand inspired by their own family travels. Martinhal properties combine family elements with luxury, comfort, and style in their Portugal resorts and Lisbon hotel. 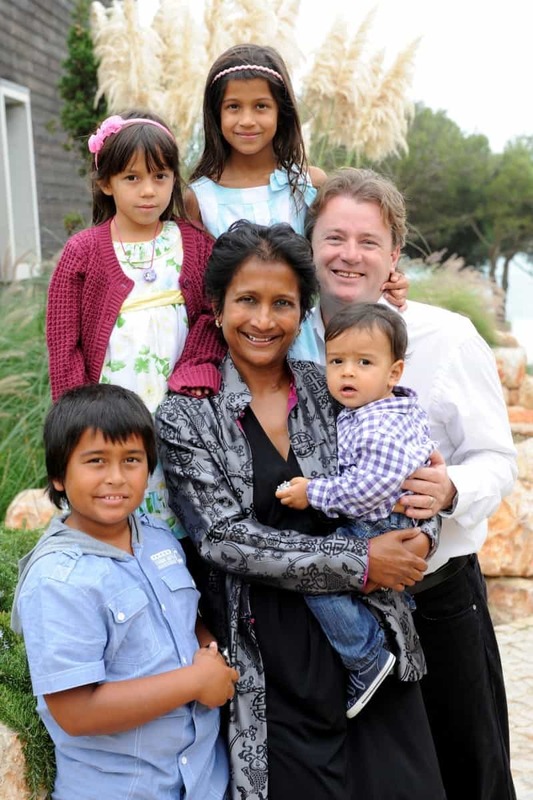 Martinhal Family Hotels and Resorts owners Chitra and Roman Stern are parents of four children. They observed first-hand the gap in the market for luxury, design, and family comfort combined. Their goal was to take family-friendly to a deeper level by addressing every need they could think of and offering it before a family needed to ask. With desirable locations, a commitment to great design, fine dining and non-stop family activities, the Martinhal brand buzzes in the competitive family travel market, offering some of the best hotels in Portugal for those traveling with babies and children. These camper vans (like this one from the Cascais property) are at each Martinhal resort for children to play. Photo by Zoey Goto. 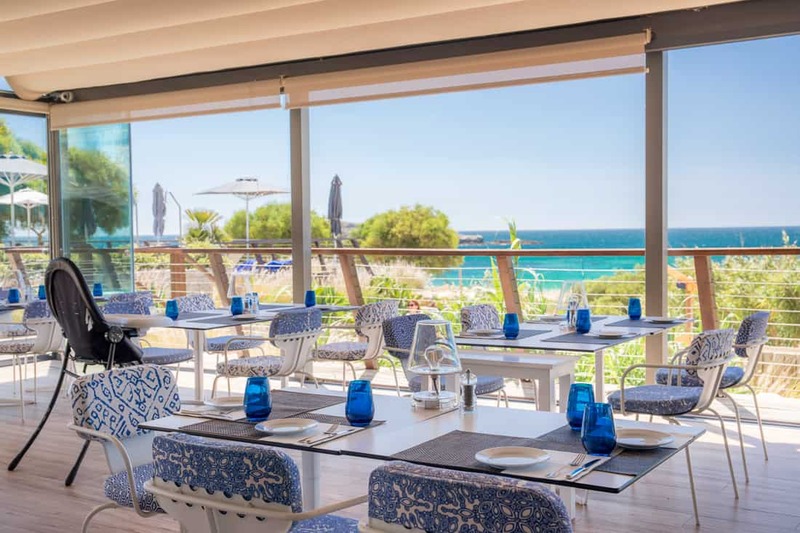 I took a road trip from Lisbon, via Cascais on Portugal’s West Coast, down to the scenic Algarve region to experience three of Martinhal’s family-centric hotels. The exterior of the Martinhal Chiado in Lisbon. 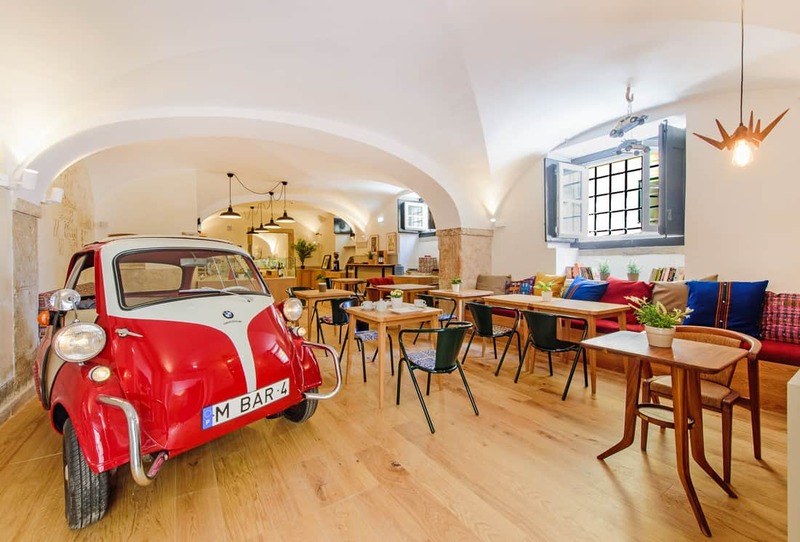 Just a short drive from Lisbon’s airport, we arrived at the Martinhal Chiado and quickly realized that this property is all about location, location, location! The large townhouse hotel, which dates back to 1855, opened in 2016. 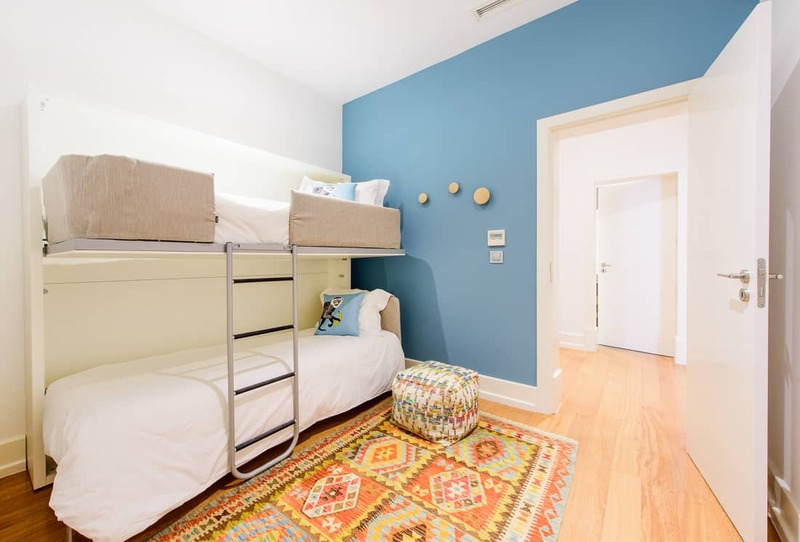 Situated on a cobbled side street right in the centre of Lisbon’s Chiado district, hotel guests have easy access to the Old Town. 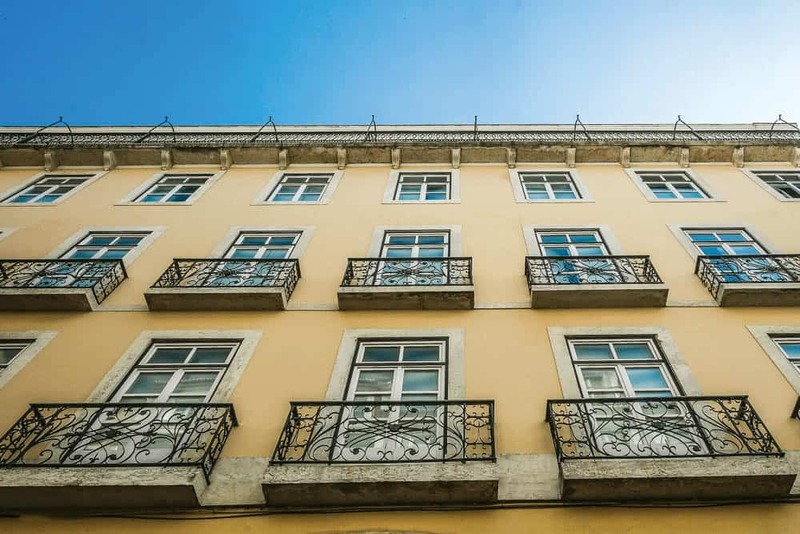 Stepping out of the Portugal boutique hotel, you are surrounded by elegant architecture and within walking distance of many of the main Lisbon sights. The Tagus River area that has recently been rejuvenated with restaurant and retail activity, is just at the bottom of the hill. And speaking of hills, be warned—Lisbon is a city best explored wearing flats! Views from the Martinhal Chiado in Lisbon. For a central city hotel, the rooms are generously sized and have large bay windows with child safety locks and pretty balconettes overlooking the street below. Interior designer Dagny Bain created the interiors leaning Scandinavian in style. Pops of colorful fabrics and paintings by local artists blend with muted neutrals. Inside the hotel are 37 apartment suites, ranging from studios to two-bedroom apartments with bunk beds that can accommodate a family of six. All have a kitchen complete with a stove, fridge (pre-stocked with milk and juice upon arrival), a dishwasher, basic cookware, a washer and dryer. Essentials such as highchairs and children’s toilet seats are already set up in the rooms. There is also a wonderfully convenient baby concierge service, where guests can pre-book and borrow everything from bottle sterilizers and baby bouncers, to strollers and baby slings. This means that a family of four could realistically arrive for a week’s holiday with just hand luggage – something that was previously unheard of in our family! This genuine understanding of parents’ needs perhaps stems from the fact that the Sterns designed Martinhal to address the problems they faced on their own travels. Kids’ clubs are unicorns in city hotels. 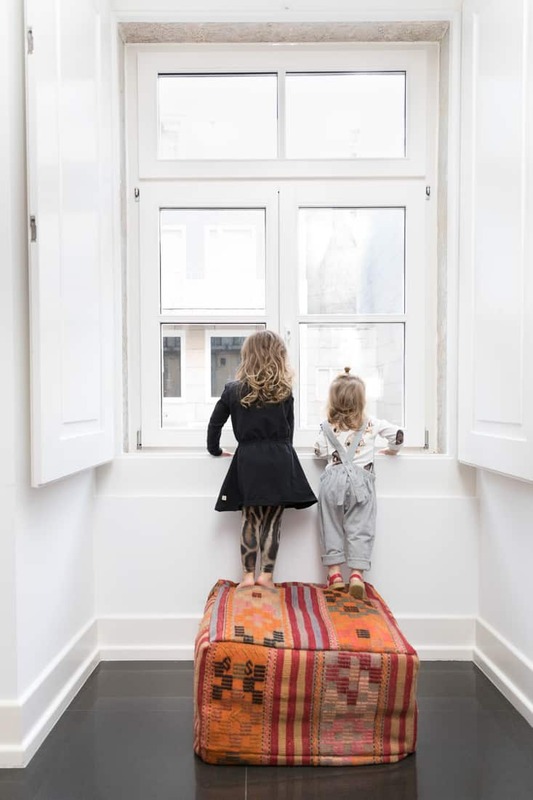 The Martinhal Chiado extended-hours kids’ club gives the parents the option of either exploring Lisbon as a family, or as a couple. Children can play day or night while it opens from 9:30AM to 10PM. Themed play sessions fill in the day with discos and movie nights at the evening pajama club sessions. Parents and kids embrace this amenity rare for a city hotel, and even rarer that it is open year-round, not just for school holidays. As with all the four Portuguese Martinhal properties, the room rate includes the kids’ club from age 2 upwards. Care for babies aged 6 to 24 months costs around 25 euros for a two-hour session, and the concierge can arrange in-room babysitting for an additional fee. If your children need to let off steam, the hotel even has its own climbing wall with a tented ceiling and lots of toys and activities. It is located just outside a tranquil playroom for parents and younger kids. Just across the lobby you will find the M Bar, a relaxed café style lounge offering healthy buffet breakfasts and light lunches. It closes at 7PM, when room service takes over until 11:30PM. 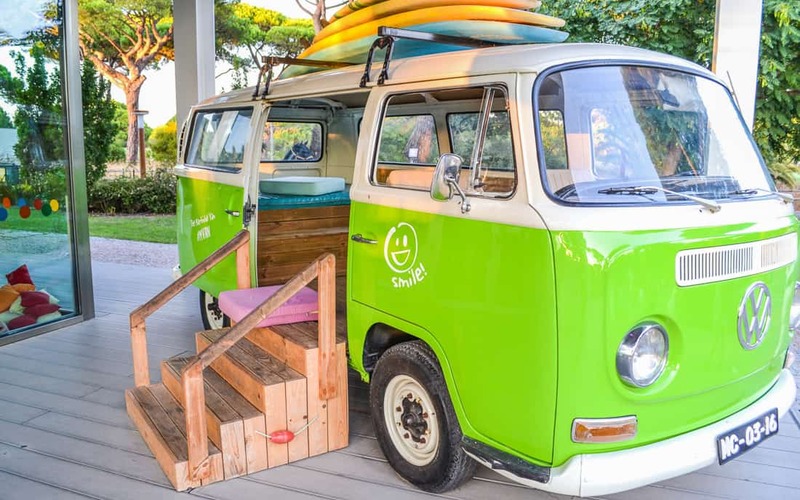 At the entrance of the café is Martinhal’s signature VW Camper van, which can be found in all the property’s restaurants and is much loved by the hotel’s younger guests, who can climb inside and pretend to drive. If you decide to venture out in the evening sans-children, great dining and watering holes abound. 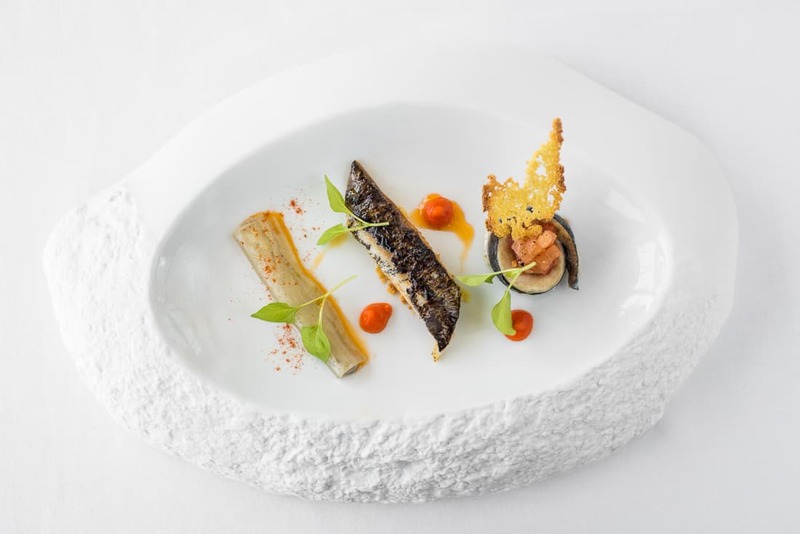 Within a short walk awaits Bairro de Avillez, the restaurant of acclaimed Portuguese chef José Avillez. Also close by is Lisbon’s trendy bar area – Rua Nova de Carvalho, or the Pink Street, a pedestrian area where the pavement is painted in a distinctive fuchsia hue. 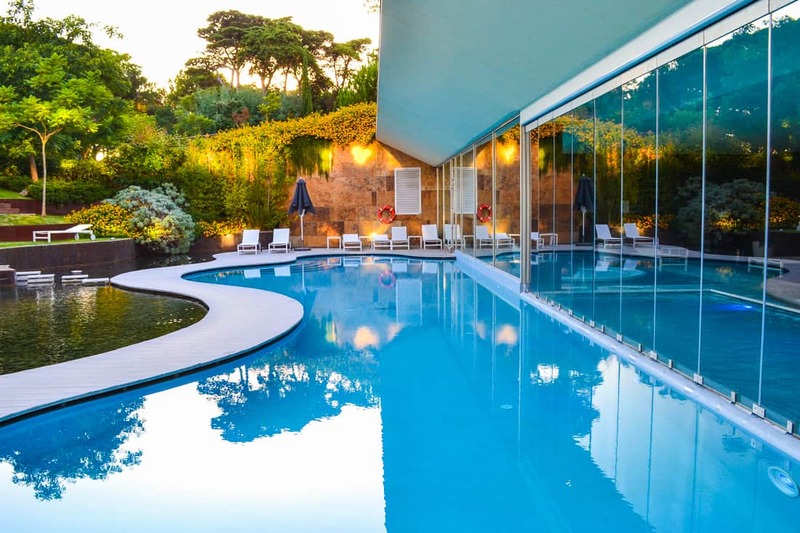 Should you need to escape the heat of the city and plan a pool day, guests at the Lisbon property have the option of using the swimming pools at the Martinhal Cascais property (pictures below). Transfers between the hotels take around half an hour and cost an additional fee, though use of the pool is complimentary. 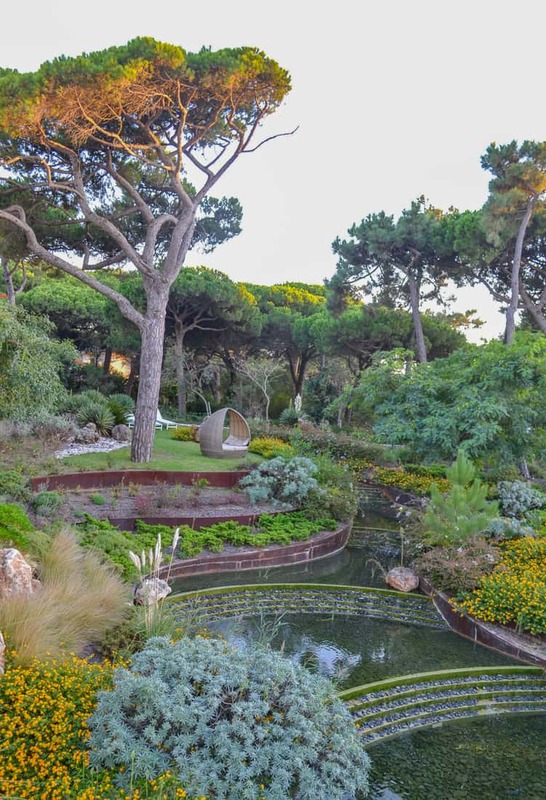 Just a short drive away from the hustle and bustle of central Lisbon, is the Martinhal Cascais resort, which has an abundance of outside space for children to roam free. The resort is located in the affluent Cascais area, known locally as the Beverly Hills of Portugal. It is just 30 minutes from central Lisbon, and a short drive from the Unesco World Heritage Site of Sintra, while the picturesque seaside town of Cascais is just ten minutes away on the hotel shuttle bus. The serene Cascais property thirty minutes from Lisbon. Photo by Zoey Goto. There are 72 rooms, ranging from studios to villas that can accommodate multigenerational and larger family groups. The owners realized much was needed through their own experience of traveling with extended family. The rooms within the main hotel building have a glass window separating the bedroom and bathroom, allowing parents to keep an eye on the children in the tub and also for light to flow through the rooms. The inside-outside pool at the Cascais resort. Photo by Zoey Goto. This inside-outside design is repeated throughout the hotel, with floor-to-ceiling windows taking advantage of the natural light and views across the manicured landscape, creating an overall feeling that is light and airy. It works well with Portugal’s mild climate and blue skies. The restaurant’s design may be high-end, but the atmosphere is refreshingly child-friendly. Kids happily wander around the restaurant, making noise and no one seems to mind – the relief on the parent’s faces that they have found such an accommodating destination is visible. In the morning, the resort’s O Terraço Restaurant serves up a bountiful buffet, including the Portuguese pasteis de nata, a type of custard tart. These were a big hit with the younger guests. Sardines served three ways at O Terraço in Cascais. In the daytime and evening, this is the place to try local seafood dishes from the à la carte menu, which includes local specialities such as baked cod, and sardines served three ways. There is an age-structured children’s menu, too. In a toy-filled kid’s corner, friendly staff entertain the little ones while parents finish their meal. The resort also has an Italian-style restaurant called Os Gambozinos, serving up pizza, pasta, ice cream and an extensive selection of homemade baby purees. Just below Os Gambozinos is the spacious Kids’ Clubhouse. 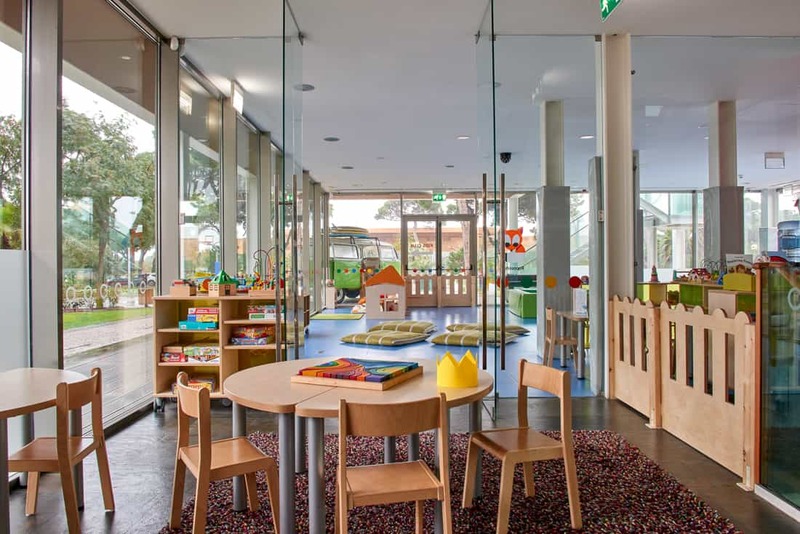 Its 7,700 square feet are divided into age appropriate sections, accommodating children from 6 months to early teens with everything from playmats to PlayStations. It’s a cheerful place, with colourful décor and enthusiastic staff who supervise activities such as swimming, Lego building and archery. 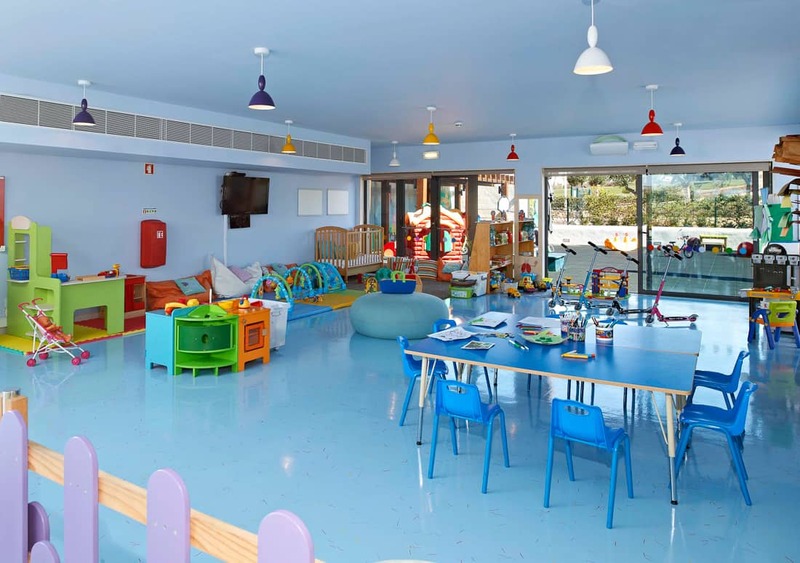 The Martinhal Cascais Kids’ Club is included in the room rate. One of the unique aspects of this kids’ club is just how much outside space the children have. Within the gated playground is a huge pillow trampoline, a futuristic looking dome covered swimming pool (perfect for babies who need to be shielded from the midday sun) a climbing frame, swings and a slide. Should you want to visit the local castles of Sintra but feel that younger kids might not cope well with the crowds and heat, then the Clubhouse is a great place to drop the children off for the afternoon while you go and explore the local area. 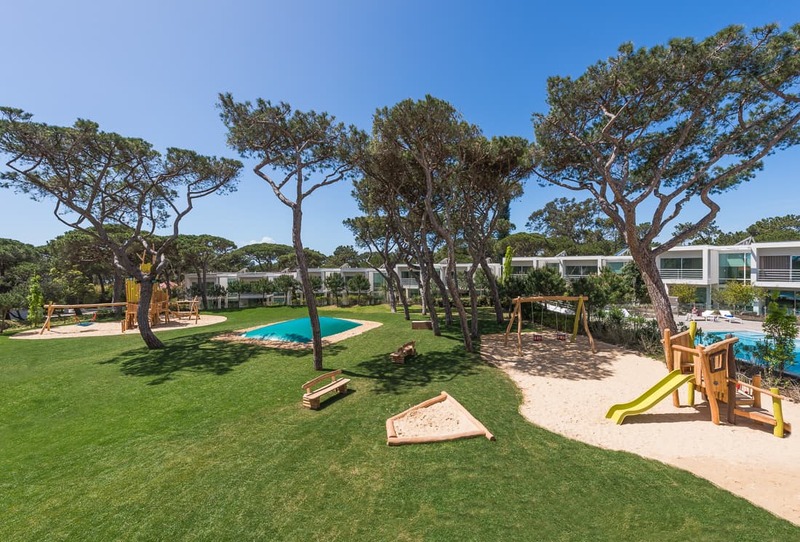 Our stay at the Martinhal Cascais offered us the best of both worlds – plenty of beautiful outside space for kids to enjoy, combined with easy access to the city and the sights. This is definitely one of the best places to stay in Portugal for location convenience. Heading down the coast to the Western tip of Portugal’s Algarve region, our final destination was the stunning Martinhal Sagres resort. 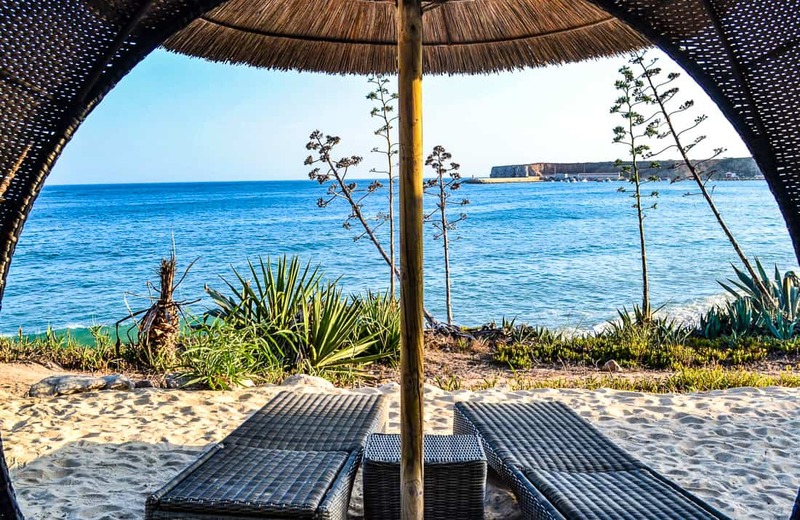 Although it may be a little more challenging to get to – with either a 3-hour drive from Lisbon or a 1 hour 20-minute trip from neighboring Faro airport – it is such a family-focussed paradise, that the extra journey time was definitely worthwhile. The Martinhal Sagres sunset. Photo by Zoey Goto. 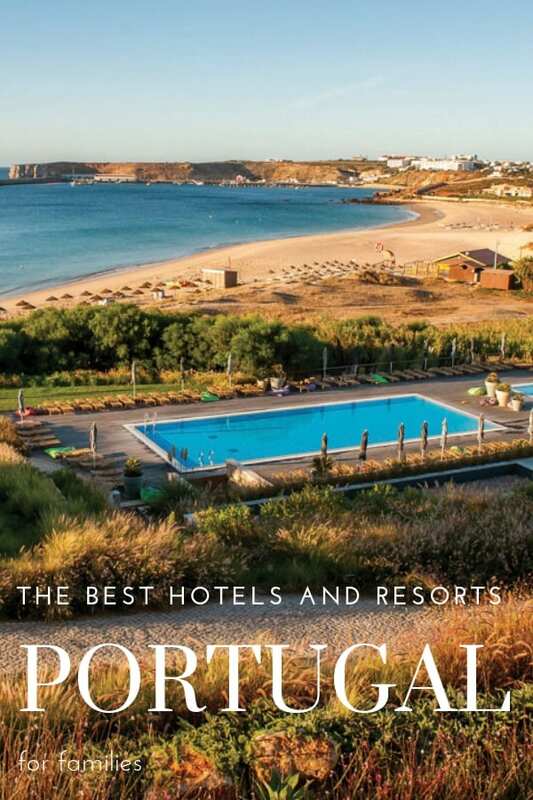 The five-star resort is situated in a protected natural park on Portugal’s unspoiled western Algarve coast, near the historic fishing port of Sagres. Positioned on a gentle cliff overlooking the sea, our biggest dilemma of the day was whether to visit the pools or the beach. Both are very inviting! With an emphasis on luxury meets nature, the colors of the local landscape are reflected in the stylish furniture. The entire resort, from the buildings to the interiors, was designed by British design authority Sir Terrence Conran. The floor-to ceiling windows frame the hotel’s adjoining beach. Guests view the vanilla sands and striking, azure color of the waters everywhere. The accommodations range from interconnecting hotel suites with balconies to five-bedroom villas with private pools. We stayed in a one-bedroom ocean house with panoramic sea-views, which offered an ideal space for a couple with a baby. Wandering around the laid back resort, it quickly becomes apparent that kids have been central to these Portugal resorts from birth. 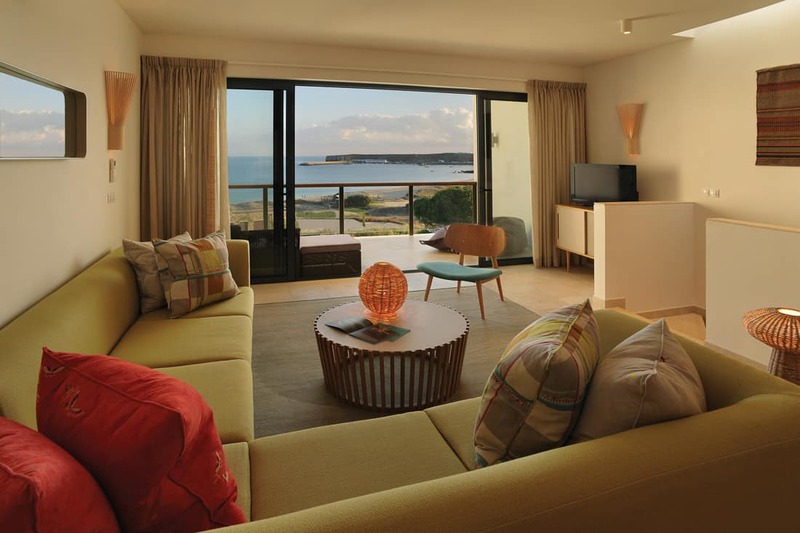 The Martinhal Sagres Kids’ Club is complimentary for hotel guests. There is plenty of outside play equipment, including trampolines for younger children and a bike pump track for teens. Both are cleverly situated beside the restaurants, so that parents can dine with the kids playing in sight. Stroller paths lead you right down to the beach. Despite being large in size for a European resort, Martinhal Sagres has a village community atmosphere. There is a local store stocked up with family essentials such as diapers and sun hats, a little square with an ice cream bar, and a surf shack bar, where kids have their own dedicated section of the bar to order their own juices. Sagres beach lounge area. Photo by Zoey Goto. Heading down to the beach, there is a secluded hangout area with wicker loungers, another juice bar and a water sports centre. 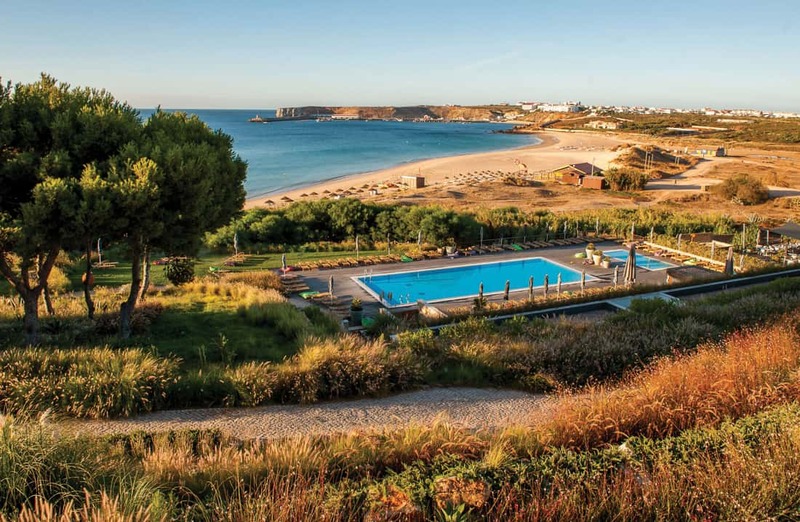 The area around Sagres is a popular surfing spot, and while the resort beach is better suited to windsurfing, kayaking and paddle boarding, local surf lessons can be organized through the hotel easily. Views of the Algarve, from Sagres. The resort also has a cycle hire school on site and we tried out a family-friendly route to the local lighthouse, Cabo da Roca. Kids are welcome to join in on the bike tours, which are adapted to the age and skill of each individual. 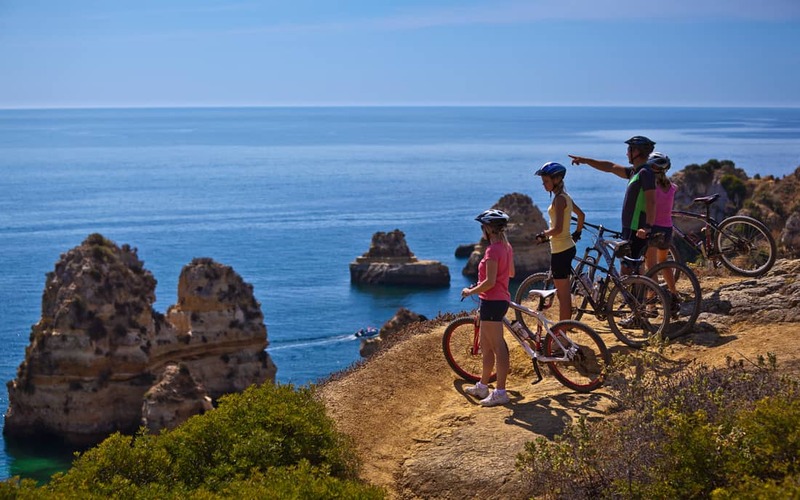 The Martinhal Sagres offers bike tours for all levels. Our charismatic tour guide Jerome took us on gentle terrain through the nearby nature reserve and past picture-perfect beaches. As we were out of high season, the beaches were almost deserted, but for a few surfers and families with pre-schoolers. Onsite is a small but serene spa called Finisterra, with an extensive menu that caters for the whole family – from pregnancy and couples’ treatments, to parent and child massages and tweens and teens facials. I indulged in a little me-time with an express back massage, where my therapist managed to untangle my stress points in just half an hour, leaving me feeling revived. The price points are reasonable for a luxury resort spa, with the 25-minute parent and child massage, facial or manicures costing 65 euros. 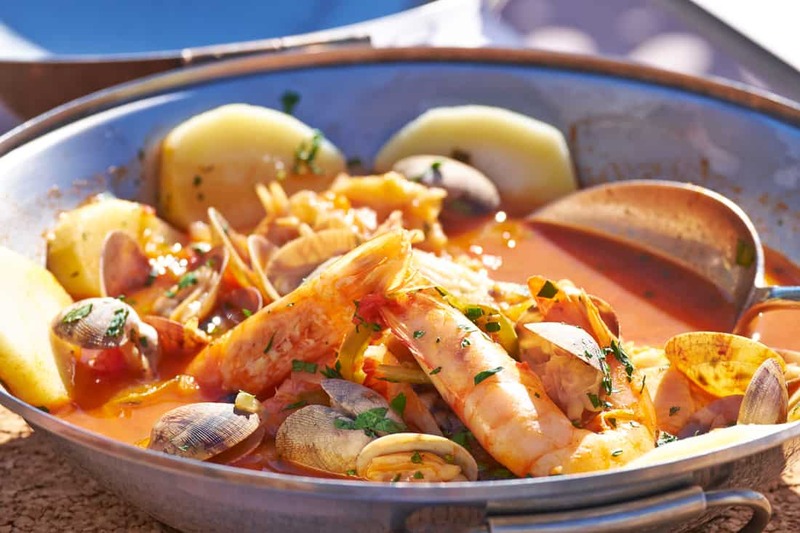 As Dunas features seafood at the Martinhal Sagres. Of the three onsite restaurants, which all cater to families, As Dunas topped our list of favorites. The menu focuses on a wide selection of fish dishes. Sitting in the restaurant, you can actually see across the bay to the market where the chefs buy the fresh fish daily – it doesn’t get much more locally sourced! Sagres seafood prepared at the resort restaurant. Having spent a couple of days at Martinhal Sagres, I left feeling that we’d discovered a little slice of paradise for families. But each of the three Martinhal hotels offers something very distinctive and unique. Martinhal Resorts takes lots of the stress out of traveling with young children and babies. 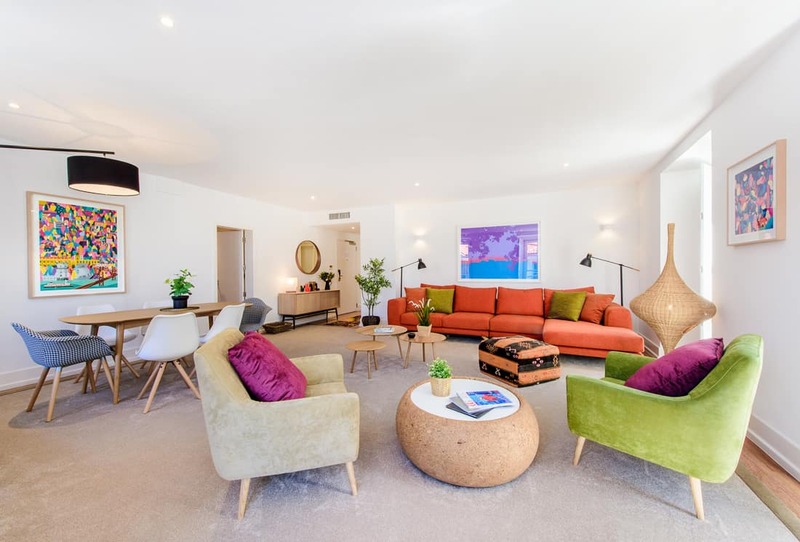 Whether it’s a stress-free city break in Lisbon, sightseeing and nature in Cascais, or barefoot luxury at the Sagres beach resort – it was easy to see how Martinhal’s vision to indulge families with an easier way to vacation. Each of the three Martinhal hotels offers has it’s own personality. 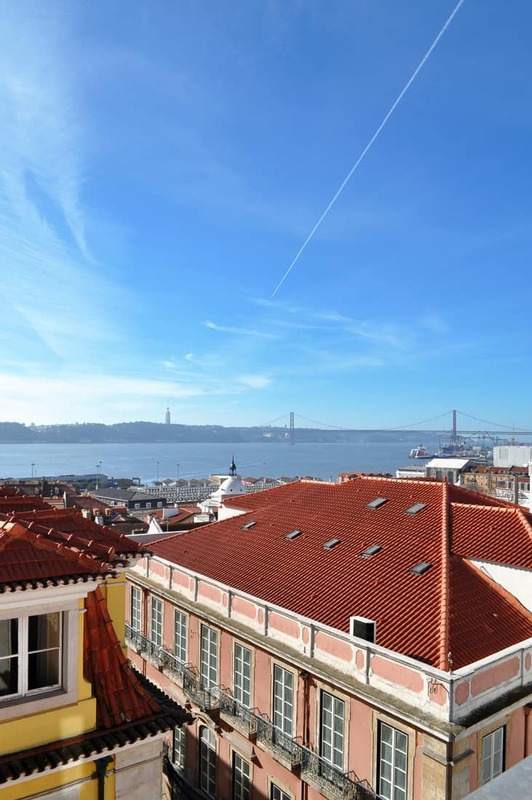 The city is on your doorstep with the Lisbon property, which would perhaps hold more appeal for older children and teens. It is also a good option if your children enjoy socialising with others in kid’s clubs, with its extended hours childcare. Families seeking a balance between sightseeing and nature should head to the Cascais property. It’s also a great option for high-energy children, as there is endless room for them to roam! But the hotel that stole my heart was the Martinhal Sagres. The food, beautiful setting and high design reminded me of the type of hotel that we sought out pre-children. It was a delight to find these aspects again in such a family friendly setting. In fact, our visit to the Martinhal Sagres resort was so enjoyable, we’re already planning our next trip – returning to experience another slice of paradise in Portugal’s Algarve. Portugal vacations offer such a variety of activities that combine historic sites, hip city strolls, and sunny beach experiences. Check out my itinerary for this trip that includes lots of things to do in Portugal with kids. I was a guest of Martinhal Resorts and flew with TAP airlines, but these opinions are entirely my own. Well I’m ready to visit Portugal! Those Martinhal resorts are amazing for families. I am stunned at how beautiful and dreamy these resorts look! Indeed, they thought of every detail. I love that the Martinhal resorts were created based on the owners’ own experiences and needs traveling with kids. That makes a big difference, when you’re traveling with kids, to have a hotel focusing on making your stay family friendly!